Take advantage of recreational opportunities offered, including an outdoor pool, a spa tub, and a sauna. This hotel also features complimentary wireless Internet access and a television in a common area. Make yourself at home in one of the 51 air-conditioned rooms featuring refrigerators. Complimentary wireless Internet access is available to keep you connected. Bathrooms have showers and hair dryers. Conveniences include safes, housekeeping is provided on a limited basis, and cribs/infant beds (complimentary) can be requested. Featured amenities include luggage storage, laundry facilities, and a safe deposit box at the front desk. A roundtrip airport shuttle is provided for a surcharge (available 24 hours). Hidden in a lush garden just 600 metres from Malia Beach in Crete, 32 kilometres from Nikos Kazantzakis International Airport and 35 kilometres from Heraklio Port, this hotel offers all the standard features and services – just as free parking – and so much more. Fitted with stone floors and beamed ceilings, all of the cool, air-conditioned rooms open out to a balcony with views of the surroundings, while some suites also have a seating area. Guests can have an American-style buffet breakfast, before heading out for a day of beach fun or sightseeing. Other entertainment options include billiards, and in the evening travellers can enjoy a relaxing TV night by the fireplace. Each week, a barbeque night is organized by the pool, while a short walk will take guests to a number of local bars and taverns. Take advantage of recreation opportunities including an outdoor pool and a spa tub. Additional amenities at this hotel include complimentary wireless Internet access, a fireplace in the lobby, and tour/ticket assistance. 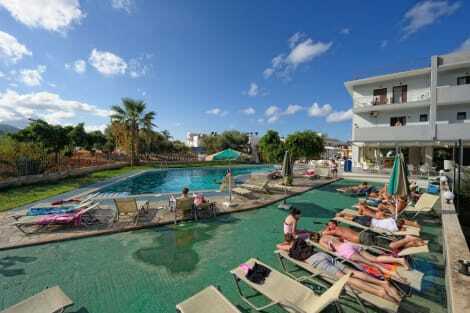 Sunshine Studios is situated in Malia is just 18 minutes walk from the beach. Featuring a seasonal outdoor swimming pool, . This 2-star hotel offers a garden. The hotel features garden views, a terrace and a 24-hour front desk. All rooms in the hotel are equipped with a coffee machine. Featuring a private bathroom, rooms at Sunshine Studios also offer free WiFi, while certain rooms are equipped with a balcony. Guest rooms will provide guests with a toaster. Malia Strip is 200 m from the accommodation. Heraklion International Airport is 27 km away.